There is a beautiful little park near the sea, Centennial Park in St. Andrews, New Brunswick, Canada. 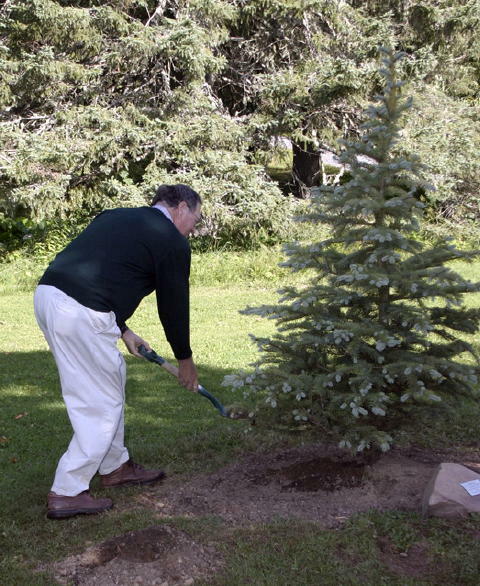 There on September 6, 2004 a Colorado Blue Spruce was planted and a red granite rock placed beside it. The plaque on the rock says "In Memory of Thomas Washburn, Engineer ... Donated by St. Andrews Centre for the Arts". 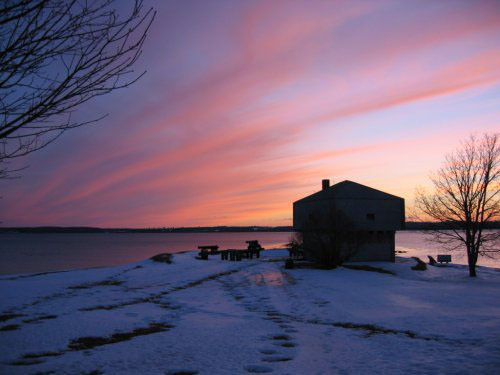 Nearby is a wooden Blockhouse, the only remaining one of many built to defend New Brunswick in case of an invasion by Americans during the War of 1812 and manned again during the Fenian Raids of 1866. 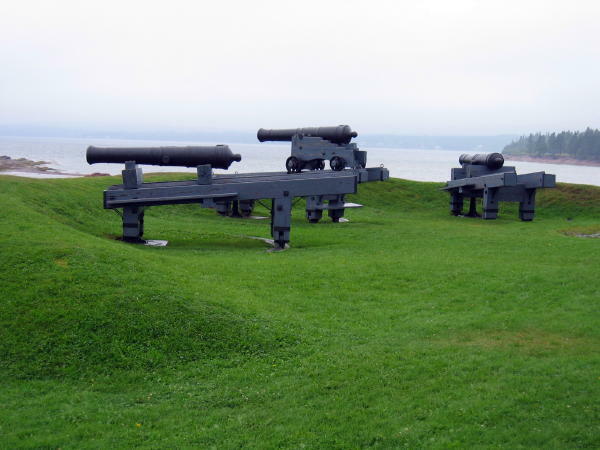 Three ancient cannons not fired in either conflict still face Robbinston, Maine to protect the entrance to St. Andrews harbour. Behind the little fort is Centennial Park, created from a fallow field 100 years after Canadian Confederation. It was opened by Queen Mary, mother of Queen Elizabeth in 1967 when Thom was nearly four. Thom's interest in military history was undoubtedly influenced by this historic little seaport. Thom was part of the third generation of his family to have straddled the cannons as children and dreamed dreams there. Now his nieces and nephew hide in the old trees, catch frogs in the ponds, and follow the stream as it flows onto the intertidal zone rich with wildlife. They climb on the sandstone ledges enclosing the harbour and, on the rising tide, risk getting trapped on these red rocks and forced to wade to dry land. Exciting stuff for young visitors. Thom loved St. Andrews. He and his siblings came here as children to visit their grandparents, Earl and 'Stella Caughey. Here Thom attended hockey school and arts and nature camps. He swam at Katy's Cove with a myriad of cousins. He sailed a 24 foot sloop the "SharonSue" with his grandfather and played golf on "the little nine". He read books from the library where his grandmother was librarian. As a young man he worked several summers in local restaurants and one year fell in love with the girl he later married, Donna Harrison of Toronto. After his grandfather's ashes were scattered among a grove of trees on the Algonquin Golf Course in 1993, he told Donna that that is where he too wanted his ashes placed. We are not ready carry out those wishes yet. In the meantime, with the tree as our focus, we now all have a special place to remember Thom. We will hear his voice in the laughter of children and remember his youth and his love of this place and this community. Val Bryce, Maureen McIlwain and Chandra Leavitt, with others, donated the tree, stone and plaque and organized the tree planting event. Arnold Leavitt pre-planted it with the Town's blessing. More members of the St. A Centre for the Arts gathered to dedicate the little spruce to Thom. We are truly blest to have such good friends. While the Town's setting is very beautiful, it is the good people in it that makes St. Andrews such a great place to be. Entrance to Centennial Park. 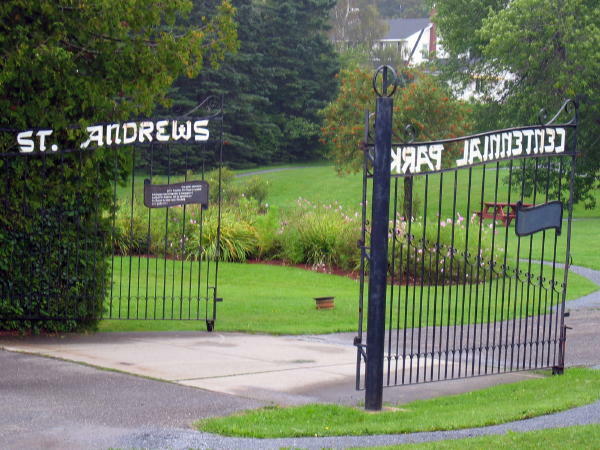 Park opened by Queen Mother in 1967 and owned by Town of St. Andrews. Blockhouse built by townsfolk around 1812 to guard entrance to St. Andrews Harbour. In distance, Joes Point (and golf course) to the right, the red rocks to the left and the State of Maine beyond both. Click on photos to see enlargements. Photo of Owen Washburn by son Ken, others by Sheila Washburn, 2004/2005.